For a discussion of the Water Dreamings theme see Bardon and Bardon, 2004, p. 49 and for further discussion on the artist and the Water Dreamings see ibid p. 157 and p. 61 (Map 8) for a detailed map of the artist's country (homeland). The most absorbing interest in Warangkula's art was the Water Dreaming. 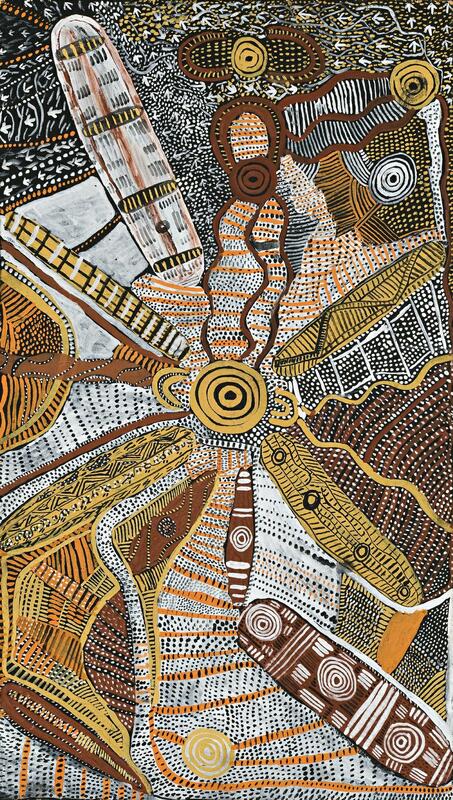 His intricate depictions of the permanent soak of Kalipinypa or the waterholes of Tjikari and Ilpili display a determination to paint the complexity of his country, his heritage. Representing the activities of the Waterman ancestor at the site of Kalipynipa, our painting is characteristic of the complexity of Tjupurrula's work. Easily read as a map of country depicting water courses, vegetation and birdlife, the painting also illustrates white egrets and the response of birdlife to rain, travelling vast distances as the seasons change. The arrow shapes at the base of the painting show footprints of the Egret ancestor, the 'U' shape are the seated ceremonial Watermen, the wavering lines are running water and varied linear and dotted backgrounds are differing types of vegetation (bush tucker). John Kean credited Tjupurrula with discovering the use of dots to illustrate vegetation. The dominant ovoid forms represent Tjuringa (sacred objects) and the central roundel the ceremonial site for the activities of the Watermen and the Egret ancestors.